Amid the national debate over raising the federal minimum wage to $10 per hour, Scott Leavitt of Boise says he and his fellow advisors have been enrolling clients in their state’s health insurance exchange for an hourly wage that works out to about $4.50 – and sometimes even less. "What is happening is that agents are making half the commission they previously made and doing twice as much work on the front end enrolling people in coverage," he said, adding that many exchanges were still not functioning well. "If you’re earning $9 for each client you enroll and you have to spend two hours with each client to sign them up for a plan and you have 10 hours in a day – you do the math." Leavitt, past president of the National Association of Health Underwriters (NAHU), said the combination of additional work plus lower commissions brought about by the Affordable Care Act (ACA) has prompted about 25 percent of health insurance agents nationwide to leave the business since the law took effect. 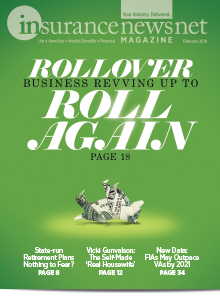 "They either are giving their book of health insurance business to someone else, or retiring early or diversifying their practice," Leavitt said. The relatively brief enrollment period added another burden to the advisors’ workload, Leavitt said. "Before the ACA, you could enroll people in coverage all year long. Now, we have to squeeze all this into three months." Agents really felt the financial squeeze in the second enrollment under the ACA, but clients got a bigger surprise with the impact of deductibles and copays. That’s after getting clients past the balky enrollment process. "It’s taking some agents two or three hours on the phone with our state’s Department of Health and Welfare just to get their clients qualified for subsidies," Leavitt said of Idaho’s exchange. "Then they get back to the clients to pick their plan, and it’s taking two or three days to get that information back to our exchange so that they can be enrolled. And it was the same way last year." Remember before the first ACA enrollment period – back in 2013 – when President Barack Obama said that consumers would be able to go online and buy health insurance in the same way they go online to buy an airline ticket? That turned out to be an apples-to-oranges comparison, according to Leavitt. 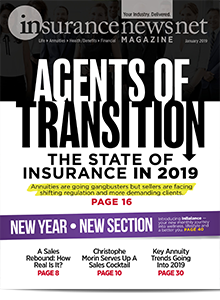 One of the biggest challenges for agents has been helping clients find a balance of the lowest premiums and the most manageable out-of-pocket expenses. For some agents, that pool of clients grew this period with the employer mandate, in which companies with more than 100 full-time equivalent workers must offer health insurance to at least 70 percent of their staff or face a fine. In Phoenix, Lori Crandall started working in July 2014 to get her employer-group clients ready for the start of enrollment season on Nov. 15. Her challenge was not only to recommend plans that cover mandated coverage at the lowest possible cost, but also to help employers meet two requirements: that coverage must be comprehensive and affordable. Comprehensive means that the policy must cover at least 60 percent of the group’s collective medical expenses and cover the mandated list of essential health benefits. Those essential health benefits include ambulatory patient services, emergency service, hospitalization, maternity and newborn care, mental health and substance abuse treatment services, prescription drugs, rehabilitative services and devices, laboratory services, preventive and wellness programs, chronic disease management, and pediatric services. Under the ACA, plans must cover 100 percent of the cost of “preventive services,” which include various screenings including blood pressure, cholesterol, mammography and colonoscopy, as well as immunizations. 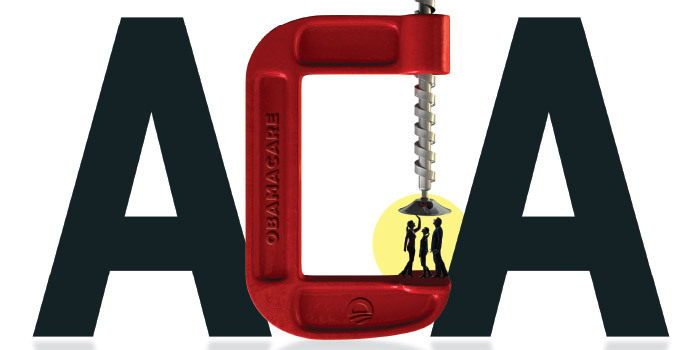 Affordable means that premiums cannot cost an employee more than 9.56 percent of his income. This applies only to coverage on the employees themselves – not family coverage. "But that premium percentage is based on the income of the lowest-paid employees," Crandall said. "So, for example, if workers cannot pay more than $99 a month, the employer is on the hook for the rest of it. 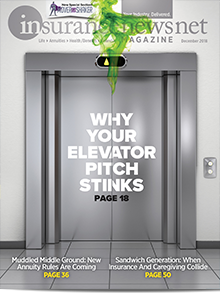 As a result, we are seeing plans with higher out-of-pocket costs for the employees." Those higher out-of-pocket costs are zinging consumers and raising concerns for advisors. Creating new health coverage access "will be a wasted effort if people are unable to pay for their coverage," NAHU CEO Janet Trautwein said in a statement earlier this year. Trautwein issued the statement in response to President Barack Obama’s 2015 State of the Union address in which he touted the millions of people who gained access to coverage as a result of the ACA. "Making coverage affordable for everyone doesn’t just mean providing generous subsidies to help people pay for coverage; it means examining what is causing the cost of coverage to skyrocket and taking a hard look at the cost of medical care," Trautwein’s statement continued. "An accurate rendering of the affordability of health insurance must take skyrocketing deductibles, copays and coinsurance into account too," she said. "Thus far, health care reform has not done so. Coverage won’t be truly accessible or affordable until our leaders address these other important components of the cost of health insurance." These out-of-pocket costs aren’t cheap. ACA requires that health plans place a cap on the maximum out-of-pocket costs for enrollees, based on the out-of-pocket limits in high-deductible plans that are eligible to be paired with a Health Savings Account. The current out-of-pocket limits are $6,600 for an individual and $13,200 for a family. On top of that, workers are responsible for copays that go toward their deductible. The issue of premiums versus out-of-pocket costs is making health insurance even more complicated for consumers. Do consumers buy a lower-tier “metal” plan (bronze or silver) that has a lower monthly premium but higher out-of-pocket costs? Or do they pony up more money each month for premiums on a gold or platinum plan that provides fewer out-of-pocket surprises? It appears that most consumers are lining up somewhere in the middle on this, with about two-thirds of Americans selecting silver plans that cover 70 percent of costs. Just how much are consumer health care costs going up? It depends on whom you ask. First, a word about premiums. Kaiser Family Foundation analyzed benchmark silver and bronze plans across the nation in January and found that premium increases between 2014 and 2015 were an average of 2 percent for silver plans and 4 percent for bronze plans. However, the Kaiser analysis found some wild percentage swings in some parts of the nation. Premiums for bronze plans in a section of western Minnesota increased by 43 percent while premiums for silver plans in southeast Alaska jumped by 34 percent. Meanwhile, bronze and silver plan premiums in Summit County, Colo., showed the steepest drops, at 40 percent and 45 percent, respectively. But premiums don’t tell the whole story about health care costs. Consumers also are on the hook for deductibles, copays and coinsurance. And those costs are rising and hitting policyholders right between the eyes. Sally Poblete is the CEO of Wellthie, a software company that provides services to health care website providers. "I think there still needs to be a lot of consumer education as to how a health plan looks," she said. "People are looking at the premiums they have to pay but not the deductibles, copays and other out-of-pocket costs. 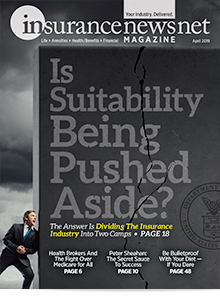 Health insurers and advisors have an opportunity to educate consumers." She cited an Avalere Health analysis that showed average deductibles increasing from 2014 to 2015 across all metal plans offered on the exchanges. Platinum plan deductibles went up the most, at 23 percent. They were followed by silver plans at 7 percent, gold plans at 6 percent and bronze plans at 4 percent. However, that same Avalere Health analysis showed that the majority of plans offered on the exchanges had deductibles that were less than the maximum dollar amount permitted under the ACA. Seventy-four percent of silver plans offered on the exchanges have maximum out-of-pocket limits below what the ACA requires, with an average out-of-pocket cap of $2,500. For those who selected a platinum plan, 98 percent of those plans will have a maximum out-of-pocket below ACA limits, with an average out-of-pocket cap of $69. Among gold plans, 94 percent will have out-of-pocket costs below ACA limits, with an average out-of-pocket cap of $860. Among bronze plans, 71 percent will have out-of-pocket limits below ACA requirements, with the average out-of-pocket costs capped at $5,500. Meanwhile, a HealthPocket study of 2015 ACA plan deductibles showed out-of-pocket costs add up to an intimidating chunk of change for policyholders. HealthPocket showed that the average 2015 deductibles for bronze plans are $5,181 for individual coverage and $10,545 for a family. Average silver plan deductibles for 2015 were $2,927 for an individual and $6,010 for a family. 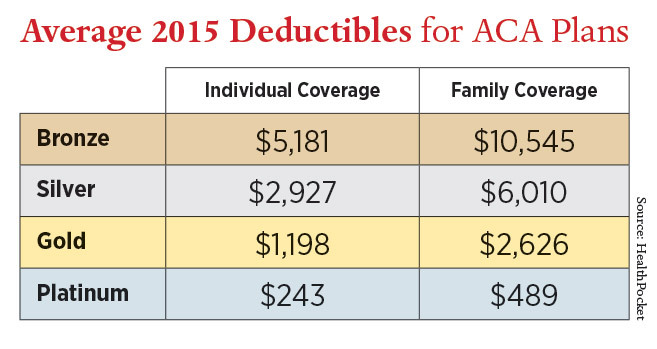 Among gold plans, average 2015 deductibles are $1,198 for individuals and $2,626 for a family. Platinum plan deductibles averaged $243 for individuals and $489 for families in 2015. Those who have health insurance are finding that out-of-pocket costs are eating up a significant percentage of their income, according to The Commonwealth Fund’s report “Too High A Price: Out-of-Pocket Health Care Costs in the United States.” The report states that 21 percent of adults who have health insurance spent 5 percent or more of their income on out-of-pocket costs over the past year – not counting premiums. An additional 13 percent of adults with coverage spent 10 percent or more of their income on those same costs. Low-income adults were hit especially hard, with 41 percent of those making less than $11,490 a year spending 5 percent or more of their income on out-of-pocket health care costs and 31 percent spending 10 percent or more. The report further states that many individuals are selecting insurance plans with higher out-of-pocket costs as a way to keep premium costs in check. These out-of-pocket costs are taking a bite out of income. The survey showed that 43 percent of respondents with private insurance said their deductible was either difficult or impossible to afford. 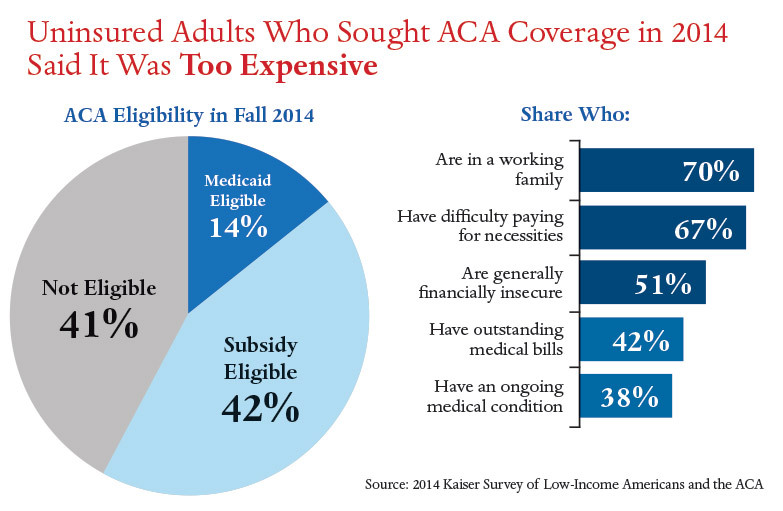 Again, these costs are hitting low- and moderate-income people particularly hard. Nearly half of those making $22,980 to $45,960 a year, 64 percent of those making $11,490 to $22,980 a year, and 59 percent of those making less than $11,490 annually described having a difficult or impossible time affording their deductible. Deductibles are hitting not only those who are buying their own coverage but those who receive coverage through an employer. Another Commonwealth Fund report released at the end of 2014 states that premiums for employer-sponsored health insurance grew 4.1 percent per year between 2010 and 2013, following passage of the ACA, compared with 5.1 percent per year between 2003 and 2010, before the ACA was passed. But family incomes have grown even more slowly during that time period, meaning that workers are spending more of their income on their employer health insurance. Premiums rose 60 percent between 2003 and 2013; incomes grew only 11 percent. Employee premium contributions, meanwhile, increased 93 percent over this period. » Premiums are consuming a larger share of workers’ incomes. Average total premiums for family coverage, including both employer and employee contributions, reached $16,029 in 2013, or 23 percent of median family income. This is an increase from 15 percent in 2003. In 2010 and 2013, employees contributed 4 percent of their median income for employee-only, single coverage, up from to 2 percent in 2003. » Employees are spending more on premiums. Workers contributed an average of 21 percent to their employer health plan premiums in 2013 for employee-only coverage. This was unchanged from 2010, but up from 17 percent since 2003. However, while the percentage of employee contributions stayed the same between 2010 and 2013, the actual dollar amounts rose because premium costs went up. In 2010, employees contributed $1,021 on average to their health insurance premium; in 2013, they spent $1,170. Over the 10 years between 2003 and 2013, the report found a 93 percent increase in the dollar amount that workers contributed to their insurance premiums. » More employees are paying deductibles and those deductibles are higher. In 2013, 81 percent of workers had deductibles, compared with only 52 percent in 2003. During this time, average deductibles also more than doubled, rising from $518 in 2003 to $1,025 in 2010 and $1,273 in 2013. Deductibles were 2 percent of median income in 2003, rising to 5 percent in 2013. So how are consumers dealing with out-of-pocket costs? Many are dealing with these costs by sitting at home instead of sitting in a doctor’s waiting room. The Commonwealth Fund reported that 46 percent of those earning less than $22,980 a year have skipped going to a doctor or filling a prescription because they can’t afford the copayment or coinsurance. Forty percent of those whose deductibles amounted to 5 percent or more of their income also reported that they skipped medical care because of the out-of-pocket cost. A sizeable percentage of the public says the cost of health coverage has forced them to go without it. The Kaiser Family Foundation studied adults who remained uninsured as of the end of 2014 and found that two-thirds of those who didn’t purchase coverage said it was because they either did not qualify for a subsidy or that the coverage was too expensive. An estimated 4 million adults fall into what is known as the "coverage gap," with incomes too high to qualify for their state’s Medicaid program but unable to afford coverage even with a subsidy. Under the ACA, low-income people who earn too much to qualify for Medicaid have to pay between 2 percent and 9.6 percent of their incomes on premiums before the government subsidies start. Kaiser’s researchers found that most members of this uninsured group planned to sit out the most recent enrollment period as well. The trend toward consumers having to pay more toward health care costs seems to show no sign of reversing, according to one industry observer. "I do think we’re going to see more and more high-deductible plans become the norm," said Laura Adams, senior analyst with InsuraceQuotes.com. "If that’s what it takes for people to get an affordable policy, that’s the route they will go." Adams predicted that health savings accounts, combined with high-deductible plans, will increase in popularity as consumers find them to be a way of managing health care costs. Meanwhile, Scott Leavitt, the NAHU past president from Idaho, said that what consumers often don’t realize is that while out-of-pocket costs may be an unexpected punch to the wallet, "the health care plans available since the ACA was enacted are much richer than the plans that were on the market prior to the law taking effect." For one thing, he said, the ACA prohibits health insurers from putting annual or lifetime dollar limits on most benefits that policyholders receive. Before the ACA, many insurers set a dollar limit on what they would spend on covered benefits during the entire time an enrollee participated in the plan. Many plans also set an annual dollar limit on their spending for an enrollee’s covered benefits. "Now, under the ACA, we also have the essential health benefits that must be covered, the preventive services that must be covered, unisex rates – which we did not have before – and no one can be denied coverage because of a pre-existing condition,"
Leavitt continued. "So all that means consumers can get better coverage than was available to them before. But there is a cost associated with all of it. That’s the trade-off." In addition, Leavitt said, consumers who previously had been in high-risk pools and consumers who previously were considered too sick to obtain coverage are entering the insurance marketplace, and that also contributes to higher costs. Despite the costs and confusion surrounding the continuing implementation of the ACA, opportunities exist in the industry, said one technology consultant to the industry. 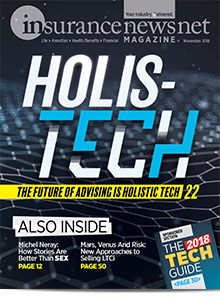 "I foresee a time when people will be able to buy down their deductibles on the individual market,” said Brian Poger, CEO of Benefitter, a San Francisco-based provider of technology for health insurance advisors. “Consumers will see that health insurance is a payment protection plan and their deductible is a prepaid medical plan." Poger predicted that health care providers will be forced to become more flexible in how care is paid for, even offering ways for consumers to finance their health care needs. 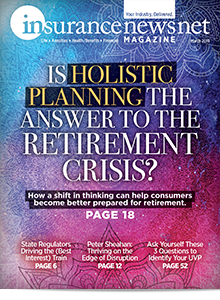 "Health care reform is driving the need for brokers – especially those who deal in the employer market – to be more holistic in how they deal with employees’ health care needs," Poger said. Poger said he believes the ACA "offers a really big opportunity for health insurance advisors but it requires a different way of thinking than in the past." "Like with any major change, there will be a whole bunch of winners and a whole bunch of losers,” he continued. “I think the brokers who reinvent themselves will be the successful ones." Advisors could charge their employer clients a fee for service, Poger suggested. Or maybe advisors could determine whether employees have needs other than health insurance that the advisor could provide. Poger suggested that advisors take a three-pronged approach to figuring out how to adapt their practice to the ACA world. "They need to have a strategy on how they are going to provide group coverage, how they will sell on the private exchanges and how they will sell on the public exchanges," he said. "And then they will need to plan how they will present solutions in all three of these areas to their clients. I think there is a path down each of these three strategies that will make advisors more money."